The autumn landscape is such an inspiration in New England! Today, I got out one of the many canvases stashed in my supply room and got to work. 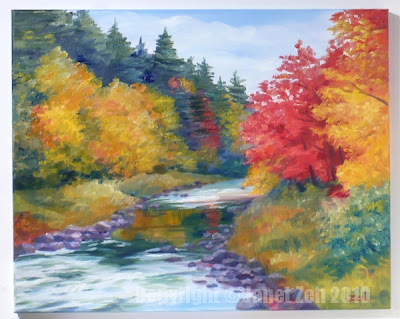 A rocky stream surrounded by brilliant foliage is the goal for this 16x20 inch painting. 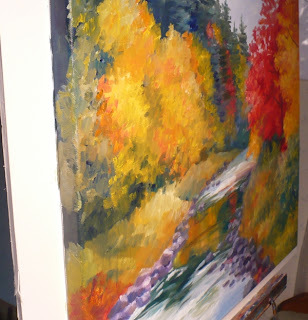 I will work in broad impressionistic strokes to convey the vigor and energy that comes with the autumn air and the bubbling mountain stream. 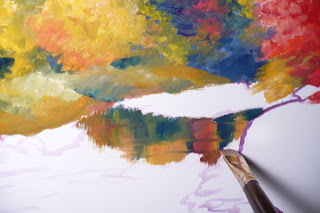 First of all, I mix a deep purple to outline the composition with quick strokes. 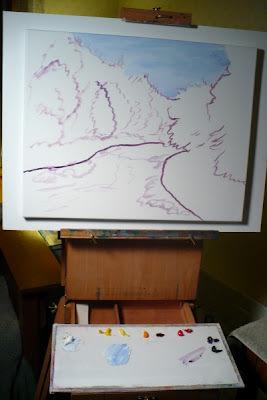 Next, the sky area is painted with pale French Ultramarine and Windsor Blue mixed with white. I make sure to add some impressions of wispy clouds. 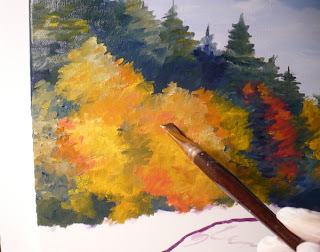 I will use a flat 1" brush with short bristles (a bright) for the entire piece except for one or two details of branches at the end. 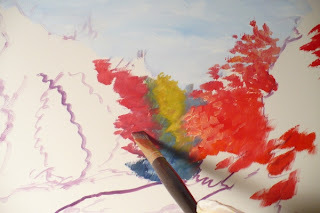 Normally, I like to start with the farthest areas since the colors are paler, bluer and duller. But this time, I painted one of the foreground trees first just to get a sense of the contrast between near and far. Then I went to the background with duller colors. Can you already see the difference? The foreground tree pops out. 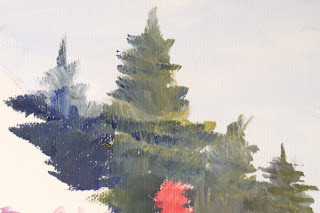 Mixing yellow and blue, I quickly paint in the tall evergreens. The flat brush is perfect for this as the trees can be painted with only a few strokes. Next I continue painting the far side of the stream. Now we get to the yellow foliage which is done with mixtures of warm and cool yellows, red and green. Here is a close-up of the yellow trees still using the flat brush. Reflections are used to denote water in a stream. Water is clear and acts like a mirror where it is still. 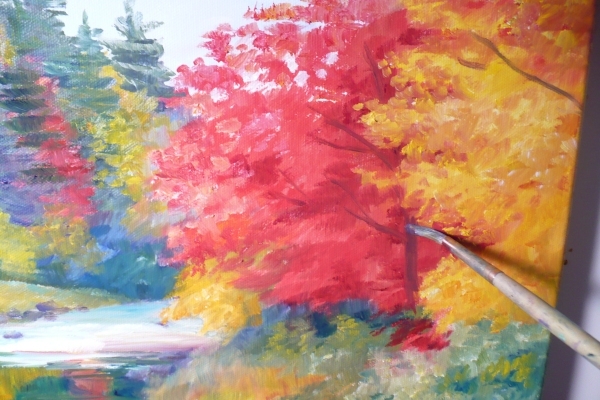 So, in the still area of this stream, I paint reflections of the trees on the opposite side. Then I take the edge of my flat brush and use it to add some streaks across the reflections. In areas of turbulence, as in rapids or rocky areas, the reflection will be broken and perhaps even missing. Instead you may see white froth. 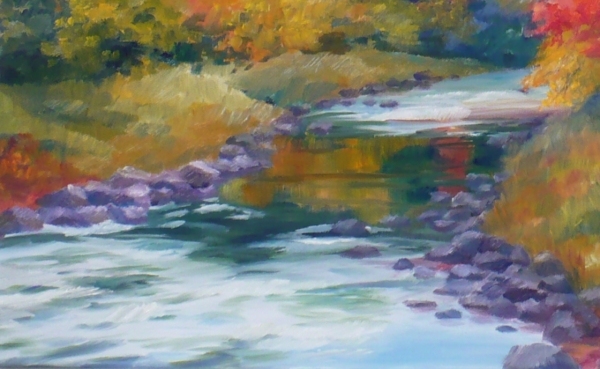 In the turbulent areas, I mix my colors with lots of white and add white highlights with broad strokes to denote rapids. 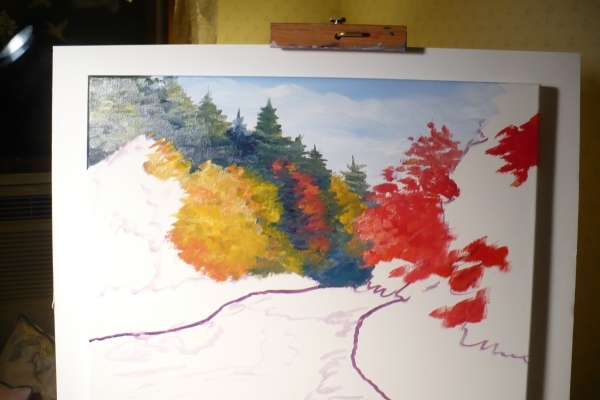 Continuing, I finish the foreground trees with a round brush this time to add a few branches. I make sure to continue the painting around the sides of the wrapped canvas edge. 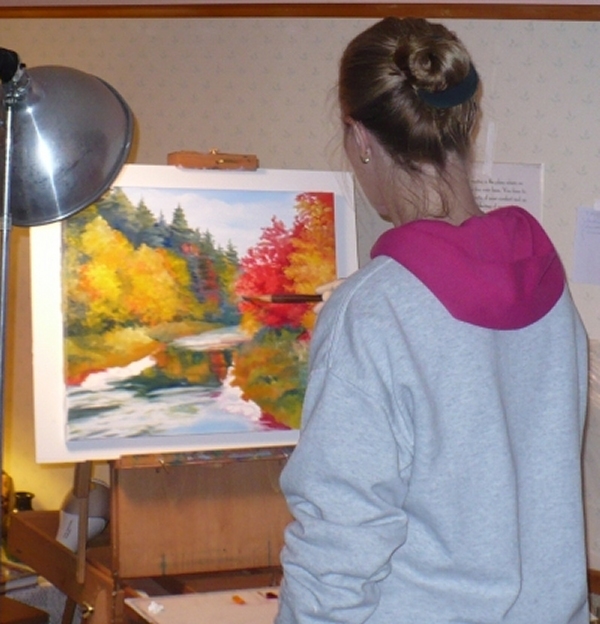 This way, the owner can have the option of framing the painting or leaving it unframed. Here is the completed painting - a blaze of color cooled by a mountain stream. Click on the image to see it larger. The original has been sold, but a fine art print of Autumn Blaze is available in my Etsy shop. Thanks for stopping by today! Your a very talented painter, and every single time I see your works of art I smile. You capture nature wonderfully.